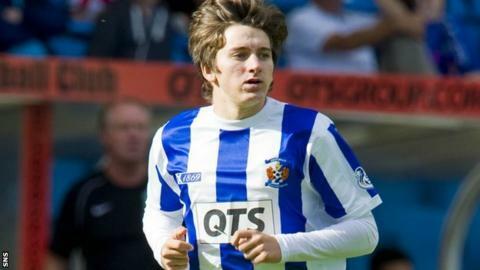 Kilmarnock winger Chris Johnston has been called up to the Scotland Under 21 squad ahead of Thursday's European Championship qualifier against Georgia. The 19-year-old replaces Bournemouth's Ryan Fraser who has withdrawn from the squad for the match at St Mirren Park. If Johnston features he will win his first cap at Under 21 level. Billy Stark's Scotland side are currently level on points with third-placed Georgia in Group three with six points from four games. Johnston has one cap for the Scotland Under 19 national team. He scored once in 11 appearances for Kilmarnock in 2012-13 and has played five times for Allan Johnston's side so far this season. Stark is also sweating over the fitness of several other players ahead of the clash in Paisley. "We have one or two wee issues with players, which is not that unusual," he explained. "Jordan McGhee has a tender ankle and Kevin McHattie had a knock as well that we will have to go carefully with. "Ryan Gauld is still feeling the effects of the knock he got on Saturday and Stuart Armstrong has a strain above his knee. "We've got to watch them which isn't ideal because we're lots of bodies down training-wise."